Highbank Lodge is a luxury one bedroom rental for 2 persons with the facility to sleep two additional people in the living area. It is situated just a few minutes walk from the coastal town of Lee on the Solent within the Alver Valley.The alver Valley now boasts a fantastic children's play adventure park, within 5 minutes walk from our property. 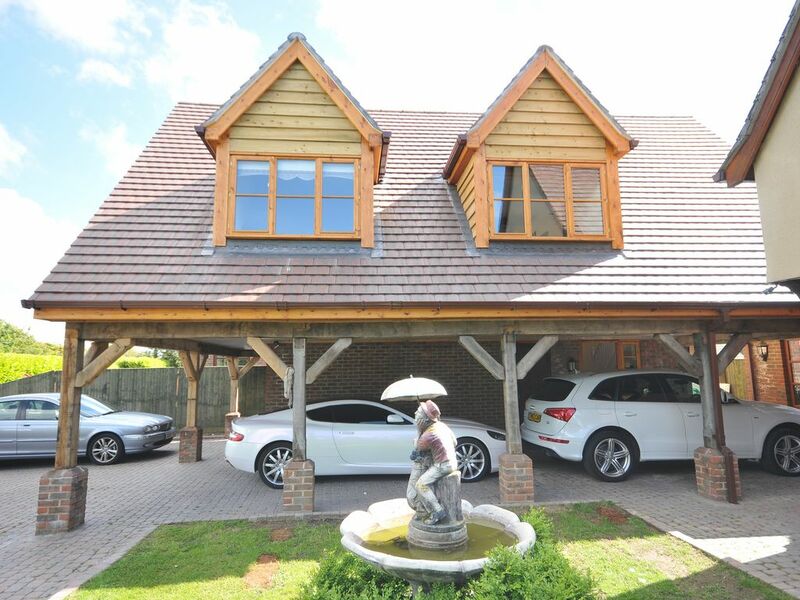 Completed in 2014 this delightful oak framed annex enjoys an Easterly aspect with far reaching views over the Alver Valley, towards Portsmouth's Spinnaker Tower. The property is tastefully appointed to ensure your every comfort. PLEASE NOTE OUR PRICES ARE FROM £75 A NIGHT, FOR THREE NIGHTS OR MORE. ONE/TWO NIGHTS ARE SLIGHTLY MORE AND ALSO HOLIDAY TIMES. Your hosts at Highbank Lodge are Tim and Tracey West. Tim and Tracey grew up in the local area and are able to advise you on all aspects of the attractions in the local area. Tim is a developer whose vision it was to build the lodge and who constructed the building personally. Tracey is an ambassador for the National Motor Museum at Bealieu and has worked within the tourist industry in this capacity for some years. Between them, their vision is to provide you with a unique visitor service, every aspect of the lodge has been considered to ensure that you, the visitor, feel comfortable and at home. However, if you have any special requirement please let Tim and Tracey know and they will be delighted to try to accommodate you. I was raised in this area and love the location near to the sea. When the opportunity arose to purchase the land and build my own property it was something I could not resist. The property is in a lovely semi rural location with beautiful views over the Alver valley. Situated a 15 minute walk to the sea with all the benefits that being close to a number of good sized cities brings. There truly is something for everyone here. For your stay we welcome you with our complimentary first night pack. This includes bread,milk,butter,eggs,cereals,biscuits,jams and spreads, Tea, coffee and sugar are also provided. The property enjoys it's own shower room, complete with WC, Basin and large shower. The lodge has a spacious and modern, contemporary living area with laminate floor, a large leather sofa and 42" Flat screen TV and I-Pod dock. The property has a very well equipped modern kitchen, with laminate floor, full sized oven and hob, extractor, breakfast bar and 4 stools, washing machine/dryer and refrigerator. All accoutrements are provided right down to the Wok. On a warm summers evening please feel free to use the garden , relax and have a glass of wine. There are a number of courses locally and these include: Cams Hall Estate, 18 holes and a 9 hole course - designed by Peter Elliss. Wickham Park, 18 Holes, Marriott Meon Valley, a challenge even if you are experienced. Lee on the Solent our closest course at less than 0.5 miles away and can be seen from the bedroom window. Notes on accommodation: This lovely self catering apartment is newly completed and luxuriously appointed. Lee on the Solent is just a few minutes walk with a good selection of restaurants, Public Houses, Cafe's, Bars and Take a ways. Not to mentions it's close proximity to Portsmouth, Southampton and the Isle of Wight. We are sorry but do not accept pets. Cleaning / Towels / Linen / Maid service: Luxury Towels and Linen included. Also as near the beach we have provide beach towels . The property is thoroughly cleaned on change over day. Spare linen is provided. Travel cot and hi chair can be provided if required. Other: The property has it's own entrance and hallway with code lock entry. The property also enjoys off road parking. Really enjoyed our stay. Very comfortable accommodation. Plenty of room for us and our 2 children. Well equipped kitchen and a very comfortable bed. Also great welcoming pack. Tracey was the perfect hostess. A gem of a place, extremely comfortable and spotlessly clean. The welcome hamper was a very generous gesture. We thoroughly enjoyed exploring the area, walking distance from Lee on Solent and a short drive to Gosport ferry over to Portsmouth. Tracey and Tim obviously want their guests to have a comfortable, enjoyable and memorable stay in Highbank Lodge. Thank you, and we hope to stay again on our next visit. Pat and Ian. Immaculate, tasteful, quality accommodation. Highly recommend a visit! A beautifully presented appartment. Immaculately clean, lots of nice touches - beautiful welcome hamper - hot waterbottle - games cupboard - gorgeous Christmas lighting. Bedding smelt lovely and clean! Very friendly careing owners. We will definately visit again. We were only there for 2 nights but made to feel really welcome. Very well equipped kitchen with all the essentials such as salt, pepper, oil, and on top of that a welcome basket! Really spacious, high quality apartment on quiet country road with the best kids park for all ages just down the track. With its position between Portsmouth, Southampton, Isle of Wight and West Wittering we had plenty to do. Just book IoW in advance! A really well equipped property, easy access for tourist places and points of interest. Tracey and Tim made us feel very welcome and it really was home from home, a lovely welcome pack greeted us which was greatly appreciated. No-,one could be disappointed with this accommodation. The beach can be accessed from the property in 2 directions, directly South to Lee on the Solent is a 15 minutes walk, whilst the very lovely Stokes Bay is about 25 minutes walk to the East. This is a fantastic location to watch the activities of the busy Solent, especially during Cowes week. There is an excellent adventure/play park 5 mins walk from property, plus beautiful walks through the alver valley just outside our gate. Southampton Airport 30 minutes drive. Bournemouth Airport 60 Minutes drive, Gatwick/Heathrow (London) Airport 1.5 hours drive. Car recommended due to rural location. Lee on the Solent 0.5 miles. Gosport 5 miles. Portsmouth 6 miles by water or 12 miles driving. Fareham 3 miles. Southampton 10 miles. London 80 miles. Booking Notes: Prices vary on number of nights and season To confirm a booking a deposit of 50% of the total booking is required Payment of the total rental less any deposit paid is due 2 weeks before your first night.We also require a security deposit to cover loss /damage . Changeover Day: Times are Flexible. Although, a general rule would be that guests are asked not to arrive before 4PM and should vacate by 10am.